Whenever I tell someone that my next phone probably won't be an iPhone, the reaction is always the same: the eyes widen and the tone of voice shifts to complete surprise. "Why not?" That's an understandable reaction. 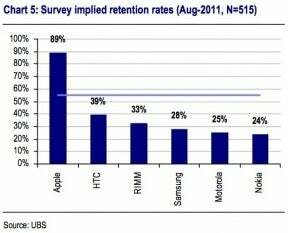 A new survey of 515 smartphone owners by UBS found that 89 percent of iPhone buyers will stick with Apple for their next handset. Another 4 percent were undecided. Android, by comparison, only had a 58 percent retention rate. Nearly a third of Android users surveyed said they'll switch to the iPhone. I don't begrudge the iPhone devotees, because I'm not the kind of technology user who exalts one platform above all others. In my experience owning an iPhone 3GS for two years, iOS is still the smoothest, simplest operating system, with better apps than any other platform. And Apple always makes great hardware. When my wife and I are in the car and need directions, we always use her Droid Incredible instead of my iPhone, because it's simply better at navigation. Voice-guided directions are available, and Google's map quality rivals any dedicated GPS. I could buy an expensive GPS apps, or use MapQuest's free navigation app for the iPhone, but I'd rather have an excellent navigation app built into the phone. About a year ago, I stopped buying individual songs and albums, and started relying on streaming music services like MOG, Rhapsody, Slacker Radio and Pandora. The voice commands built into iOS for listening to music became worthless to me, because they don't support these third-party apps. (Apple's highly-anticipated iCloud is now less useful to me as well.) Now, I lack a hands-free way to queue up music in the car, and as a result I listen to less music while I drive. Android provides a solution with the "Listen to" voice command, which can load artists in third-party music apps simply by holding the phone's search button and speaking. Throughout the day, I get a lot of e-mails from the same group of friends, which leads to lengthy conversation threads. The iPhone's Mail app is horrible at handling threaded e-mails, because you have to tap a button to read each new message. Android's Gmail app allows you to scan through an entire thread of e-mails by swiping your finger, saving time. Although Apple allows alternative Web browsers on its platform, it doesn't really let you take full advantage of them, because you can't set an alternative browser as the default. With Android, you can any third-party app as the default for certain functions, such browsing the Web, watching a video or getting directions. As far as features go, this one's pretty nerdy, but that's the kind of smartphone user I am. After two years with a 3.7-inch screen, I want a bigger phone. Fortunately, 4.3-inch displays have become the norm for Android phones, whereas the iPhone 5 probably won't have a screen larger than 4 inches. I don't care for physical keyboards, but if I did, Android would offer that option as well. Android doesn't have as many apps as the iPhone, but it has all of the apps that I use regularly, including Yelp, ESPN ScoreCenter, Twitter and Kindle. Obviously this isn't a feature, but I mention it because the iPhone's app selection is its best argument against Android or any other platform. Quantity only matters if the OS you're considering doesn't have the apps you want. In my case, Android does.